(MATT) We awoke to the new day, brushed our teeth with some Lourdes water, ate a banana, and were off to Covadonga. We arrived at the shrine at 11:50 a.m. to find out that mass was at 12 (fortunately since it is the feast day of the Ascension, a Holy Day of obligation.) 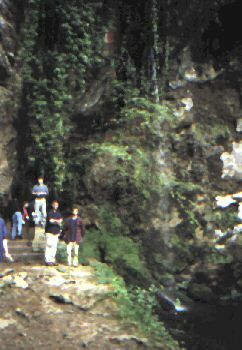 So we went to Mass, said the rosary (Chris said his in the cave itself and saw the sights.) Almost everyone there was Spanish. We guessed that very few non-Spanish tourists went to or cared about Pelayo. We thought about Dr. Carroll, saw Pelayo's grave (737 A.D.) and the museum (45 cents -- Que ganga! What a bargain!). I thought it was neat going to a place solely for one sight that we thought was really special and finding many others there that shared our feeling. I was beginning to get used to being the only ones that saw any real significance in these places. 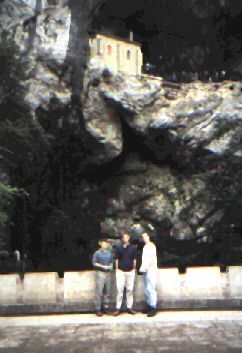 At Covadonga, in Spain, 1995, the people still remember. After almost 1200 years they still come to see their hero---Pelayo. He is an example to us all in these times. We may feel small and insignificant against the world, but think of Pelayo, rely on God, and fight on. After Covadonga, we headed toward Fatima. We stopped in a small town outside of Salamanca for dinner and ate the "menu." Wine, soda, salad, soup, chicken (steak), and dessert and coffee for 1500 pesatas ($13 U.S. each). Then we drove to Portugal without any real excitement and are now a couple hours outside Fatima. Detail about dinner: the waiter forgot to bring us spoons, so we sat there for awhile, looking at our soup wondering how to eat it. All agreed that someone should ask him for some spoons. As we sat, we discovered that, maybe we were supposed to just soak up that soup with our bread. We eventually decided that I should ask him and he was very quick about getting them. (CHRIS) Note: I learned to drive stick this morning and drove an hour or two after dinner. We had some interesting non-conversations with toll booth men. It was hard to communicate, but they kept accepting our payments from other nations cash, but it was like we spoke another language! Sam and I thought we might be better off just yelling, "'Toro, toro!" as we drove through without paying. Crossing into Spain and into Portugal were easy--no one was at the booths! It scared us the first time, because we thought we had snuck in illegally. Later we found out that our unusual red license plates are diplomat plates in Portugal and maybe Spain. This may explain why gas station guys keep filling us up but leaving all others to self-serve. Strange. Anyway, we reached Fatima about 1 a.m. After driving around its fine traffic circles for a few dozen laps, we pulled into a dead end rock/dirt driveway and parked a mile from the Cova. There was an empty lot with few rocks (relatively speaking; this is a rocky land!) where we pitched the tent.